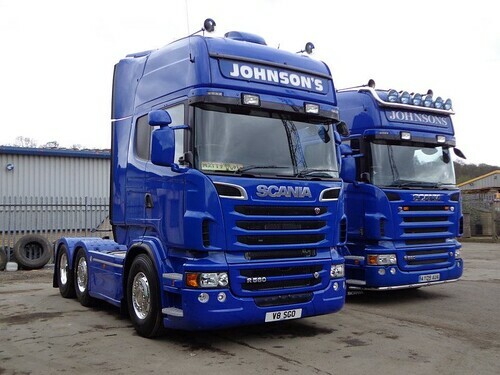 Back in February of this year the UK trucking world on Facebook nearly went into melt down, when Matthew Johnson of Johnson Transport put a photo up of his well known, well loved Scania R560 4×2 For Sale! But never fear it turns out that the 4×2 was to be replaced by a newer version of the same R560 V8 but on a 6×2 chassis, something many operators have decided to do with the ever increasing presence of VOSA and the need for 44,000kg trucks in the UK. In the photo you can see the old V8 sat just behind the new. The new one is up to Matt’s usual standard of plain & simple = smart and understated, he’s even kept the number plate; V8 SGO (V8 560). Mr Johnson is a man after my own heart as he is an Owner Driver, but has ran a couple of trucks and pulls his own trailers as well as pulling other peoples. Now as a top Owner Driver he wants to be part of the best cult club in the country, yes you’ve guessed it, he’s now part of the Truck Blog on the move gang!! I just hope Matthew pulls his own trailer more than other peoples now he has the sticker in place. I did send 2 stickers to Matt as I wasn’t sure how many trucks he was currently running. 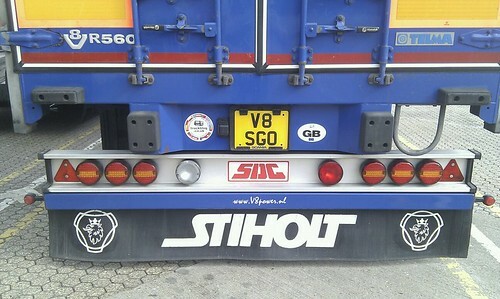 As well as the sticker on the trailer, he also has one in the windscreen. 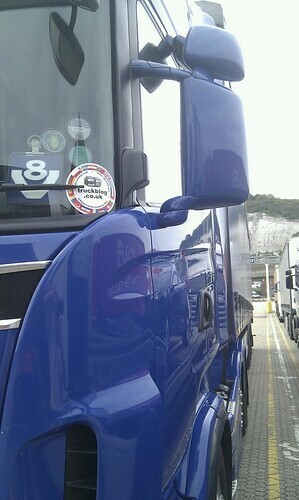 As the eagle eyed among you can see, theses pics were taken in Dover, so the TB stickers hit the continent once again!! Good work Mr Johnson, keep the blog rolling!! This entry was posted in Drivers Photos, Scania, Truckblog on The Move by truckbloguk. Bookmark the permalink.